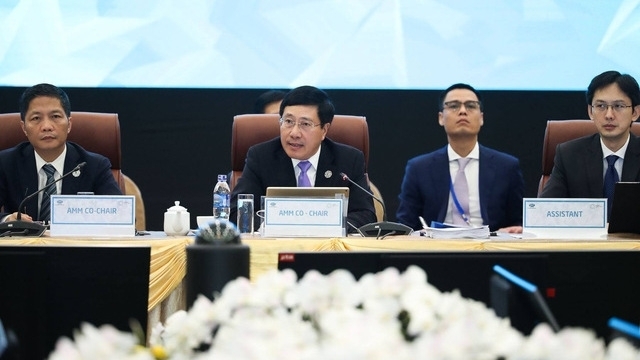 The 29th APEC Ministerial Meeting (AMM) featured three plenary sessions on the regional and global economic situation, APEC’s leadership role, and the creation of new dynamism for growth and regional economic connectivity, during its first working day on November 8, in Da Nang city. Under the chair of Deputy Prime Minister and Foreign Minister Pham Binh Minh and Minister of Industry and Trade Tran Tuan Anh, it brought together ministers from the 21 member economies, as well as the leaders from APEC’s observing organizations, such as the Association of Southeast Asian Nations, the Pacific Economic Cooperation Council, and the Pacific Islands Forum, among others. Director General of the World Trade Organisation (WTO) Roberto Avezedo presented a report on the global trade situation and the preparations for the 11th WTO Ministerial Conference. Representatives from APEC’s observing organizations briefed the participants on the cooperation outcomes over the past year and offered recommendations to boost cooperation with the bloc. Discussions will continue on November 9.